Insulation can be set on the floor concrete slabs and on the profiled steel sheet. 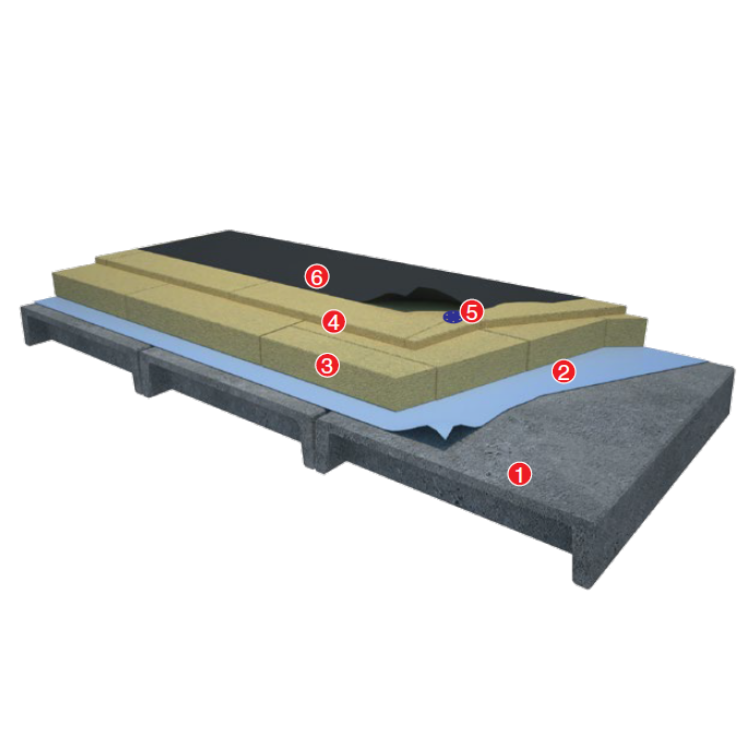 Vapour and moisture barriers should be set on the insulation boards and roofing materials covering (the roll materials, bitumen and polymer mastic) – on previously executed leveling screed. The insulation layer can have several layers of the boards of one density. Such system has high compressive strength at 10% deformation, not less, than 40 kPa. Double- layer thermal insulation is energy-efficient and economically beneficial. The insulation system is formed from the boards of different density. The upper layer is of a higher density, the lower layer is of a lower density. Such solution suggests bearing of point loads, low thermal conductivity, low cost. Triple-layer solution should be installed on the profiled steel sheet, when the calculated insulation thickness is less than half the distance between the boats profiled decking, than is h ≤ b/2. Insulation layer is formed from the boards of different density. The upper and lower layers are of higher density and the middle layer is of lower density. 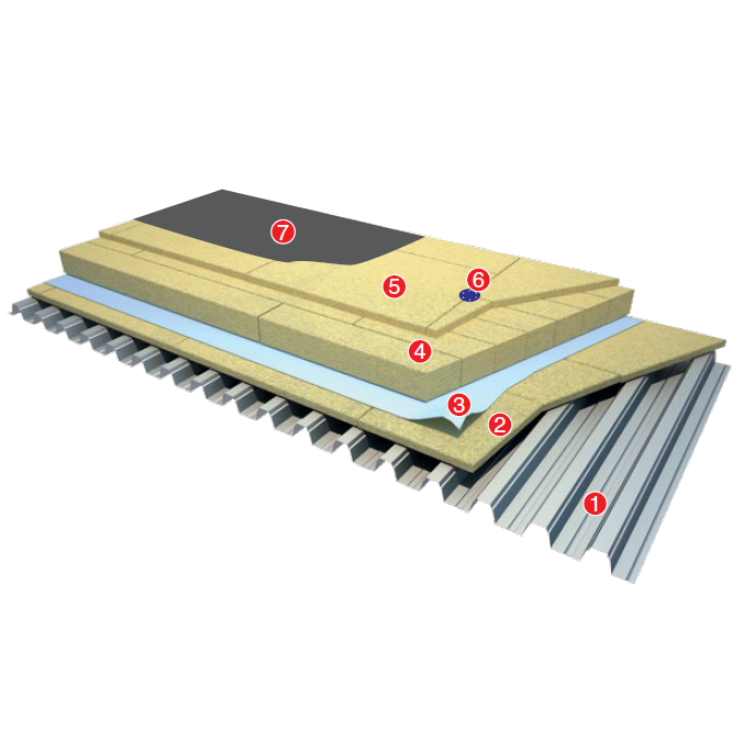 Lamella roofing thermal insulation is the most economically beneficial solution. Thermal insulation layer is formed from mineral wool lamellas and boards: the upper layer is formed of boards, the lower – from lamellas. Such solution suggests high strength of the insulation layer to loads 40 – 100 kPa, low thermal conductivity, low cost. 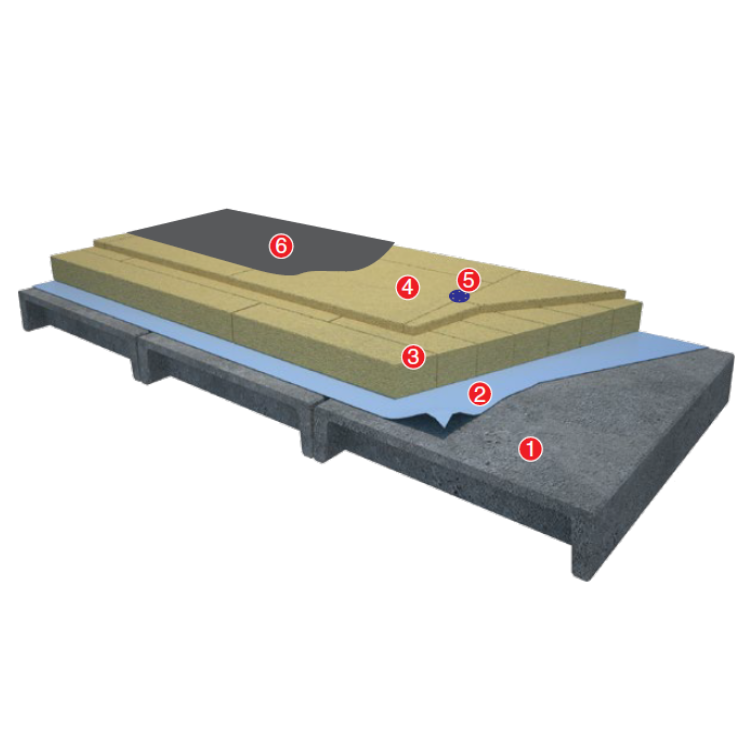 Double-layer lamella roofing insulation should be installed on the concrete slabs. 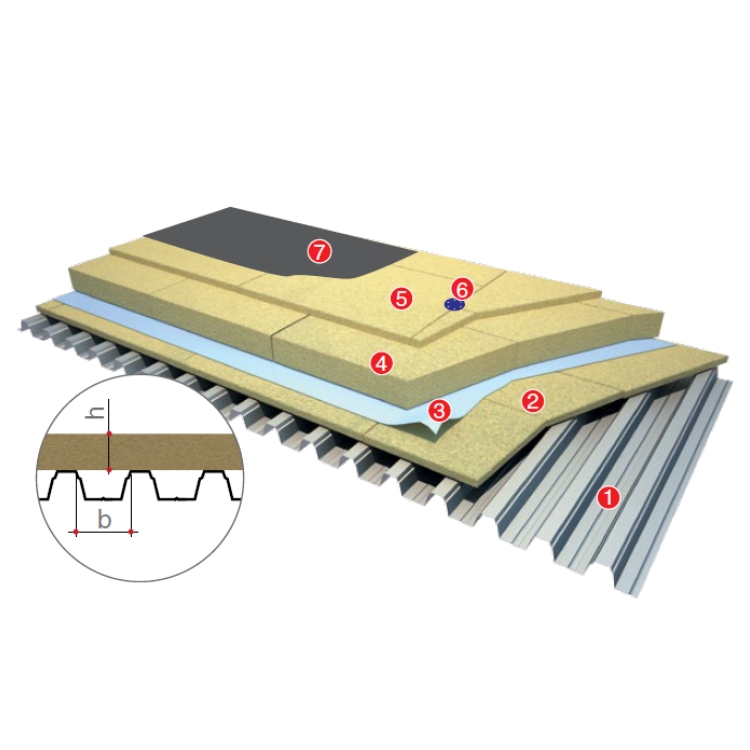 Lamella thermal insulation – is the most effective solution for insulation on profiled steel sheet. 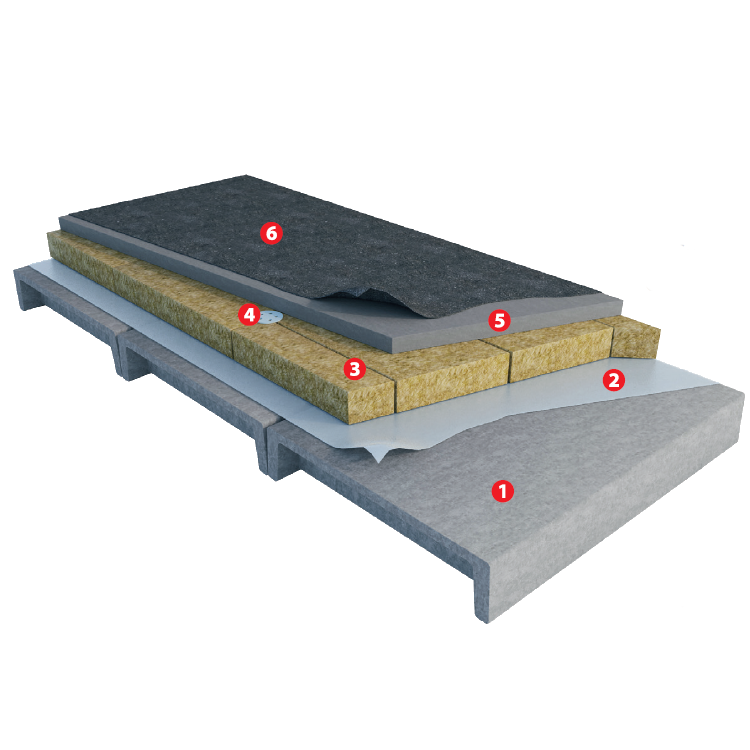 Thermal insulation layer is formed from mineral wool lamellas and boards: the top and bottom layers are made from the boards, the middle layer – from lamellas. Such solution suggests high strength of the insulation layer to loads 40 – 60 kPa, low thermal conductivity, low cost.